It has been an eventful 80+ years since the official opening in July 1931 by the Governor of NSW, Sir Philip Game. The years 1947, 1950 and 1958 were most critical; the land being nearly acquired by the Army in 1947, nearly lost after serious threat to tenure in 1950 and purchased by its members in 1958, each scraping together £100 to buy the Club by debenture. The fact that this Tier One Club is today owned by its members promotes a spirit of camaraderie and pride, as does the Club’s rich and colourful history. In December 1926 Oatlands estate was acquired by American A. C. Berk and his son-in-law, Victor Audette, who were the Australian distributors of Packard motor cars. The estate was increased with the acquisition of land from the Benson Estate (part of Rock Farm) at the north-east end of the property. Keen golfers motivated by the desire to play on a course as fine as those in their home country of America, Berk and Audette recognised Oatlands as splendid golfing country. The course design was entrusted to Rupert Black – then one of Australia’s foremost authorities on greens and fairways. Five years earlier Black was retained as chief draughtsman for the eminent Scottish golf architect Dr Alistair Mackenzie during his visit to Australia in 1926. Felling many of the towering native blackbutt trees and making best use of the terrain and natural hazards, the first six holes were developed and opened for play in 1930. A clubhouse was constructed on the highest part of the property – an area used in the early days of colonial settlement as a signalling point between Sydney and Parramatta. Nine holes were open for play by July 1931, with all eighteen holes in play the following year. The course was opened on July 4, 1931. 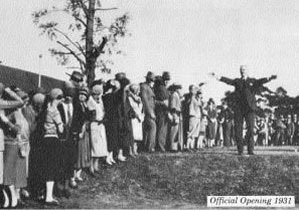 The Governor of NSW, Sir Philip Game, officiating by driving a ball from the first tee, now the twelfth, to declare the course open. To add to the merriment, the Club’s first professional, Bill Bolger, displayed his exceptional control by driving the ball from a plasticine tee placed on the forehead of his assistant. This feat he repeated using Victor Audette’s watch as tee. Both times he drove the ball onto the green and both the watch and the assistant were unharmed. This cheerful event set the tenor for the club – from the outset, Oatlands Country Golf Club was a success, both for its course and easy-going comradeship. 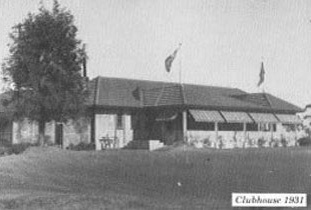 Proprietors Berk and Audette ran the club and course for the first two years. The first committee met on July 17, 1931, with Berk appointed President and Audette, the Captain. This decade was also one of the most colourful, with several of the most often told stories centred on the club’s first Professional, Bill Bolger, who was just 19 years of age when appointed. Three years into his appointment Bolger defeated Gene Sarazan to win the 1934 Australian Open, equalling the world record score for a National Championship of 283. Rising stature in NSW golf saw the Club’s elevation to Group 1 status after the war. Internationals who trod Oatlands grass in the early years include Walter Hagen and Joe Kirkwood in 1937 and the legendary Babe Didrickson who was a frequent visitor in 1939. The Australian Army commandeered the golf course from 1942 to house the 1000-strong Australian Army Corps of Signals 2. The Corp’s officers took up residence in Oatlands House and the clubhouse became the mess. Vehicles were parked in the open on the now 8th fairway and under trees for camouflage. Golf for members came to an end and while membership was kept largely intact, the golf course was not. The course was restored to the Club in April 1947 with compensation for damages awarded at just £100 per hole. That year the course was rehabilitated and extended by 300 yards to 6202 yards with par remaining at 70. All the greens were remade, the layout for the 2nd and 7th changed slightly and the 12th and 5th lengthened. The membership on re-opening was 300. On October 21 1958, the course was purchased for £91,000, the members subscribing £65,000 by debenture loans. Historic Oatlands House was sold on separate title as a reception and convention centre. In December 1963 Oatlands hosted the Australian PGA Championship and attracted a 58-strong field including five-times British Open winner Peter Thompson and Centenary British Open winner of 1960 Kel Nagle. 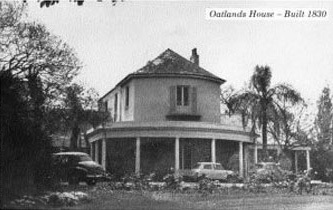 In 1962, the old Professional’s shop was demolished and the stables of Oatlands House converted into the heritage-listed Professional Shop, as it is today. In 1965 plans were discussed for the construction of a water storage dam in Vineyard Creek, the creek running parallel to the 13th and 15th fairways. After almost two years of planning and negotiations, excavations commenced and the dam was completed in December 1968. Drought prevailed during the late 70s and early 80s. Regardless, the greens were well groomed and appreciated by Australian David Graham and American Hale Irwin who played the course in 1980 in a match play series televised worldwide. Graham (then 1979 PGA Champion) and Irwin (two-times US Open champion, 1974 and 1979) shot matching 69s and praised the layout and condition of the course. 1982 saw the annual Oatlands Cup taken by well-known Australian golfer Steve Elkington, who turned Tour professional in 1985. The Club has been fortunate to have a couple of very good Club Professionals. First there is Frank Phillips who was the professional at Oatlands Golf Club from 1965 to 1967. Frank was considered one of the best ball strikers of his era, playing in 2 US Masters (1958 and 1962), the 1962 US Open and the 1964 Open Championship. Frank won the Australian Open in 1957 and 1961, as well as many other state titles. Noteworthy also was the appointment by the Board in 1990 of Peter Lonard as Oatlands Touring Professional. A former cadet member and PGA trainee at Oatlands, Lonard joined the PGA Tour of Australasia in 1988, and European PGA Tour in 1990. A few years later, in 1994, Peter Lonard became Oatlands Club Professional and in 1997 Peter had gone on to win 10 events world wide including twice winning each of the Australian Open, Australian PGA and the Australian Masters as well as the 2005 MCI Heritage Classic in the USA. Several other Oatlands members have enjoyed significant success, including amateur Paul Maslen, Club Champion on 15 occasions and was the NSW Champion of Champion in both 1992 and 1993 and LPGA golfer Joanne Mills, who turned professional in 1993, winning the German Open in 1997. Mills also won three State stroke-play championships as an amateur in Australia in 1991, 1992 and 1993 and represented Australia in 1992 and 1993. In 2000 the storage capacity of the dam was increased in capacity from seven to thirty megalitres allowing us the ability to water the entire course. By 2009 all the fairway bunkers were completely renovated to USGA standards and all the tees have been converted to couch under the guidance of Jim Wilcher our current course architect. Oatlands was the host of the NSW Women’s Open, sponsored by Bing Lee, the inaugural winner was our own Joanne Mills. Since then we have hosted the event a number of times, with Laura Davies winning in 2008, Sarah Oh winning in 2009 and 2010, Lydia Ko in 2012, Caroline Hedwall in 2011 and 2013, Joanna Klatten in 2014 and Holly Clyburn in 2015. A.C. Berk and Victor Audette would be proud of the club that Oatlands is today.